I'm not quite sure if we're on week 38 or 39,....I think last week was week 37, but I could be mistaken - Lord knows I can't keep track of things very well any more, but either way - this week's prompt from Sally over at The Studio Sublime was one of those that really made me take notice of things around me! A Quiet Moment. A moment of calm, peacefulness, self-reflection. Quiet little moments through the day where you pause, listen to your heart and breath. This week, capture a quiet moment. Well, this week was just as hectic around our house as last week, but in a totally different direction, so I was completely stumped for what to photograph - again! I love it though, because it really makes me think and observe things. 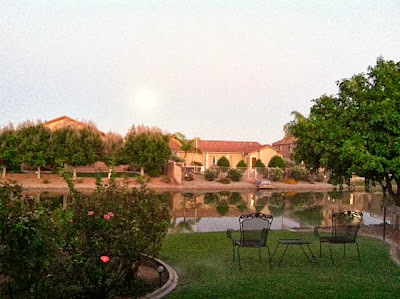 So, the hubs and I sat outside the night before the Full Moon, and enjoyed a glass of wine together and talked about all the stuff going on in our lives this week. I tried to capture the moon as we sat outside - but as you can see, or rather as you can't see - I was unable to capture it. Yes, there really is a 'Moon-Rising' in this photo. I know, it almost looks like the sun, but it's the best I could do w/my phone! It really is right there,.....just up over those houses. Then, just today (Friday) as I sat in his office and we were writing and reading emails that were going back and forth between us and our son's teacher and guidance counselor (it's all good, baby!! ), I looked down to see these,....my hubby's feet. There they were all propped up on the little foot stool thingy I gave him this week for our 19th Wedding Anniversary (we're not that into gifts, can you tell! LOL!!) and realized that even when things are hectic and seem to be going a mile a minute around you, there's still time to 'put your feet up' and just chill. Even if you are reading and writing tons of emails, answering phones, working on data review and building new classes, like he was doing all this week. And then, as I was looking at some pics this week trying to find some family stuff - I found these. Yep, this one, although he rides his motorbike with his 'hair on fire' like I've told you all before, he definitely knows how to take a 'Quiet Moment'. So thank you Sally, for once again prompting us to take the time to realize that 'Taking a Quiet Moment' (or finding one to capture with my camera!) can be nice and come when you least expect it! Now, Hop on over to The Studio Sublime and check out all the "Quiet Moments" that everyone else had this week, won't you? Peace, Love and Stealing a Quiet Moment! 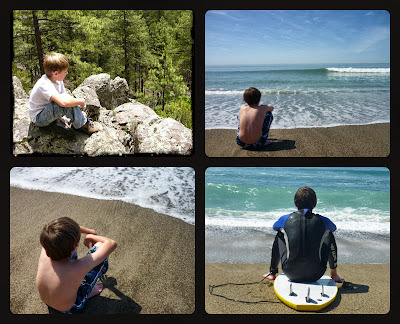 Wonderful photos. I'm glad your son does enjoy quiet moments. My husband and I aren't into gifts but sometimes we will surprize each other now an then. It really makes it more special. Yes, it sure does (make it special) doesn't it?! We got each other different things, but this was just something I picked up one day while out and about this week so he'd stop using the one under my desk! LOL!! Shel, your post really it home! 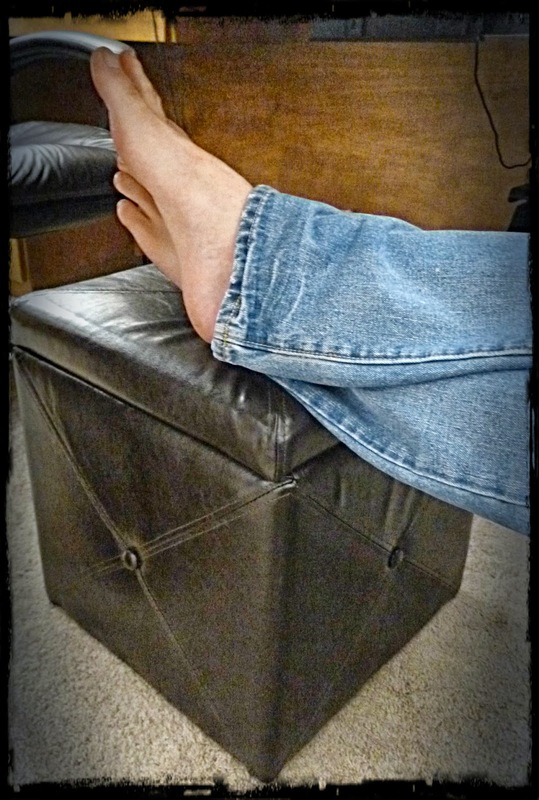 I have a hard time slowing down or sitting down much less, so the photo of your husband's feet propped up on the new stool were a great reminder. And I especially like your description - that it really doesn't have to be much, just a few moments of putting up your feet to take the time and relax. I hope you had a wonderful anniversary, btw. I love the picture of the moon rising! I see it! Your back yard looks like a peaceful haven. Great photos Shel. I like the hubby's feet pic. it really shows relaxation.